1 teaspoon cornstarch mix with a little water. Mix cornstarch with a little broth or water and add to sauce. Mix the flour, cornstarch, baking powder and salt and pepper together. Beat egg yolks (if using) and mix with soda water. Add enough soda water to make a batter that is slightly thinner than a pancake batter. Note: I prefer a thinner, crispy, tempura style batter, for a thicker batter use less soda water. Pound the chicken breasts out lightly. Fry chicken breasts, one at a time. Dip chicken breast into this batter. Hold over bowl, letting excess batter drip back into bowl. Slowly add chicken breast to hot oil, and fry until golden brown, turning once or twice. in oven to keep warm while cooking remaining chicken. 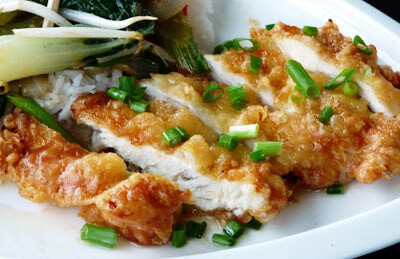 To serve, slice chicken, drizzle with lemon sauce and finish with chopped green onion.